Who Else Wants Complete Access To A ‘Behind-the-Scenes’ Look at Top Performance Enhancement Training From Two Of The Top Coaches In The Field? A few months ago at my facility in Indianapolis, NFL Strength Coach Joe Kenn and I put on an exclusive seminar where we revealed our EXACT training system for developing athletes. But before I get into that, I first want to share with you why we put this event together in the first place. Too often when you attend a seminar, you get a one-hour “Readers Digest” version of what that coach thinks or their general philosophy. You leave unsure of how practical it is, how the coach really uses what they shared, and how you can apply it to your program. That type of condensed, just-scratching-the-surface format never gives you the real answers you need…and with the cost to attend those types o seminars and the time it takes to travel to see them, your professional development efforts can become very frustrating. Don’t get me wrong, I attend and present at a ton of seminars each year, and some are really valuable. But most are set up to give you a general overview of information and not go deep into any topic. And while there are some great resources out there on entry-level programming or coaching, there isn’t much out there for coaches ready to move to the next level…you know, advanced, higher level topics. Seeing the need for a higher-level coaching workshop, Joe and I constructed the exact type of event we’d both want to attend ourselves. Our mission was simple… we wanted to really dive in and show the ins and outs of our complete training systems and exactly how we use it with our athletes. No scaling down to fit into a 60 minute session. No holding back to make sure we’re not talking over novice coaches’ heads. Sharing all of our advanced methods. We each committed to sharing the complete SYSTEM behind what we do. No theory, just our real life programs that have produced NBA All-Stars, All-Pro NFL Players and other top performers in virtually every sport you can imagine. The Elite Athletic Development Seminar was two jam-packed days that showcased Joe’s and my unique and comprehensive approaches to athletic development. This one-of-a-kind seminar ran the full spectrum, from programming to coaching and everything in-between. Why the R7/R8 approach is critical to cover all your bases in programming. How to develop programs that address multiple physical qualities (i.e. speed, power, strength, conditioning, etc.). Where most programs fail miserably – and what you can do to avoid it! A “behind-the-scenes” look at real programs, designed by real coaches. No theory and conjecture here – just the good, bad and ugly behind real programs. A step-by-step process on how to build complex programs. Chasing one physical capacity is easy – but how do you address multiple factors without killing your athletes? How to organize daily and weekly training sessions for maximum success. Advanced program design – how to develop programs for elite athletes and extraordinary circumstances. The evolution of Joe Kenn’s Tier System, and how he’s using it today to build elite athletes. Coach Kenn’s six critical factors for coaching success. The step-by-step process for building an elite program. Our exact training SYSTEM of developing high performing athletes. And the best part is that we recorded the Elite Athletic Development Seminar so that high-level coaches who couldn’t attend live could gain access to this never before shared level of information. But before I get into more about how you can personally access these recordings, I think it would be a good idea to give you a little more info on who Joe and I are. A 25 year coaching veteran on the High School, College, and Professional level, Joe Kenn is the most decorated strength and conditioning coach in the history of the National Strength and Conditioning Association (NSCA). Kenn most recently was awarded the inaugural Professional Strength and Conditioning Coach of the Year award from the NSCA. Kenn also won the College Strength and Conditioning Coach of the Year award in 2002 making him the only coach to have won both awards. Joe Kenn currently is the Strength & Conditioning Coach of the Carolina Panthers. Mike Robertson is the President of Robertson Training Systems and the co-owner of Indianapolis Fitness and Sports Training (I-FAST) in Indianapolis, Indiana. Mike has made a name for himself as one of the premier performance coaches in the world, helping clients and athletes from all walks of life achieve their physique and sports performance goals. Currently, Mike has focused his coaching on elite and professional athletes. In the past year, Mike has coached professional athletes from virtually every major professional sport, and is becoming a sought-after consultant and resource for numerous teams and programs. Introducing the Elite Athletic Development System. Your on-demand Master Class for Performance Enhancement Training. A critical component to training athletes is “buy-in.” Quite simply, if an athlete doesn’t understand why they are doing something, chances are they will not be doing it! The R7 Approach was created to not only improve the program design process across multiple coaches, but to help athletes better understand the “why” behind their training. With a more efficient and streamlined approach to training, you, your staff and your athletes will get more out of every training session. The Structure and Organization of the Daily and Weekly Plan are critical elements in the development of an Athletic Based Strength Training Program. The creation of an exercise pool, movement categories, exercise rotation, and total sets/volume to name a few can become an obstacle to many when looking for ways to create a general physical preparation program for your athletes. In videos #2, 3 and 4 Coach Kenn will break down the foundational aspects of his highly successful 3 day a week total body template. 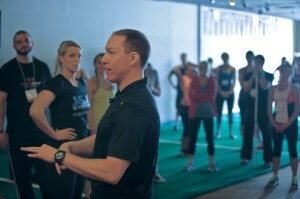 Coach Kenn will go over the traditional model which is the foundation of all of his programming. If your goal is to consistently create great training programs, you need a system for designing your programs. While many can create a solid program every now and then, using a systematic approach can help you. Furthermore, when writing a program for elite athlete who needs to develop multiple physical qualities, it’s important to have a streamlined approach to program writing. In this session, Mike will take you step-by-step through the process, to make sure you’re writing the best possible program for every athlete you train. “Embrace the Process” In the ever-evolving world of strength training it is important to stay true to your core beliefs. With that said it is also important to continue to develop and create the best possible program to enhance the physical and mental capabilities in your athletes. In Videos #7 and 8 Coach Kenn will show you how he has integrated 4+1 R’s of Coach Robertson’s R7 Approach to training to an athlete based strength template. There’s no better way to learn how to write great training programs than to review and discuss them first hand. While many coaches love to talk programming philosophy, it’s not surprising that when it comes to showing actual training programs, they often don’t have any! In this session, Mike will give you a “behind-the-scenes” look at exactly what goes into writing training programs for elite athletes. Whether it’s a short off-season or an extended period of time, there’s no substitute for looking at real work from a real coach. “So you want to be a Strength Coach?” Coaching is the ultimate art form. It truly brings out the best of one’s character, integrity, and passion. Too many times individuals choose to be coaches or want to be coaches because of what they see on the TV every weekend. In this session Coach Kenn will show you, you just don’t get to “run out of the tunnel” on Saturday nights. Coach Kenn will discuss six important rules crucial in your drive to be a successful coach. Now, regarding the investment to gain access to the Elite Athletic Development System, I want to make you aware that people who attended the seminar paid $349. Plus they also had to pay for travel, hotel, food (and adult beverages)…and they had to be there for at least 2 full days, missing work. I am not telling you anything you don’t know as live seminars can get expensive, but I thought it was important that you know the investment others made to attend this sold out event and gain access to the information you’re about to receive. Because of this, I was told by some ‘internet marketing experts’ that I should charge more than the $349 event price tag because you don’t have to worry about the cost of travel or being away from work…and you will be able to keep the information on videos and be able to access that information forever. Ultimately I decided that while this may be logical, it didn’t feel right charging more for the video course then for the live seminar, so I won’t. 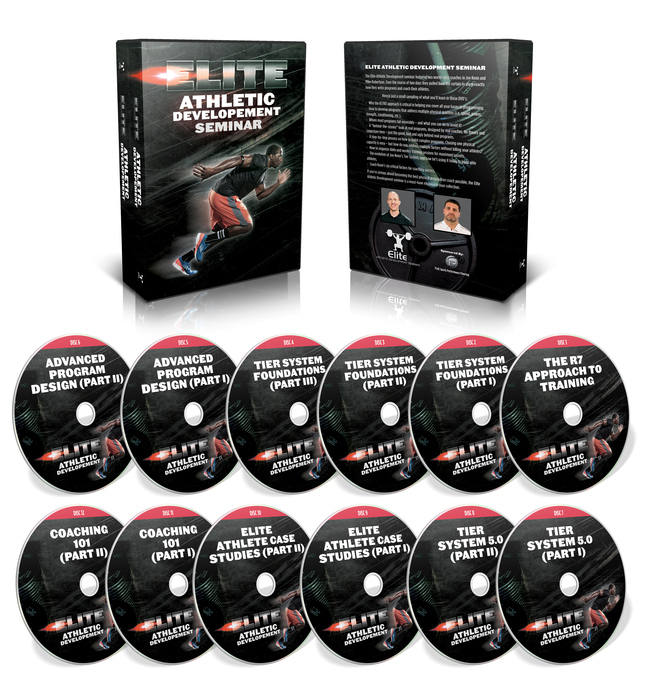 In fact, I'm going in the opposite direction – you can have the complete Elite Athletic Development System for only $297. If you are serious about taking your coaching and programming skills to the next level and want to ‘work’ with two guys that are training elite athletes every single day, then you need to invest in the Elite Athletic Development System. It’s your opportunity to finally gain access to the high-level, behind the scenes information and knowledge that you’ve been looking for.